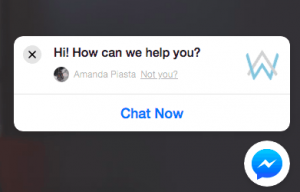 Doing Lead Generation With Facebook Messenger bots is actually pretty simple. When you use an easy to follow platform such as ManyChat, it’s just as easy as choosing the right growth tool and plugging in the appropriate information. This is one of those chat bubbles that you typically see pop up when you’re browsing a website. There are a few different versions, some are just the circle/bubble in the bottom corner, some are the bubble popped open with a chat box, and some take over your entire screen to force you to chat. While there are appropriate uses for each type, I personally enjoy the bubble that pops open a chat box after a certain amount of time. I find it less intrusive, but prompt enough to get the user’s attention. 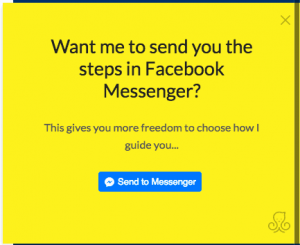 I love this lead generation with facebook messenger growth tool because you can get it to REALLY attract your users attention. Especially if you have it slide in from the top, rather than just appear. As well, you can add a nice, loud color to ensure that it is seen. I typically like to put something enticing for my users to opt-in with. 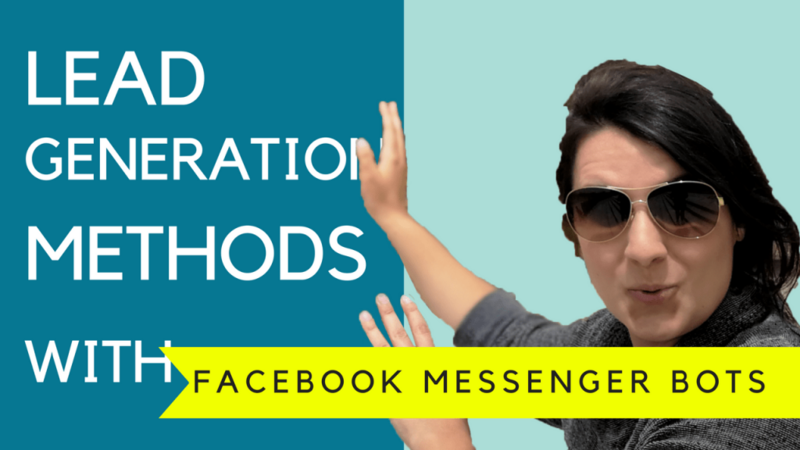 The example above is a lead generation with facebook messenger magnet! What I mean by that, is I deliver something of high-value if they choose to opt-in. That leads me to the next method…. You will see most websites offer their “lead magnet” by asking the user to enter their name and/or email address. Many online marketers will tell you that forms that are more simplistic convert higher than large forms with more fields. The reasoning behind this is because internet users are lazy these days. Especially if they are on a mobile device. They do not want to fill out a bunch of form fields to get something. So the “Send to Messenger” button now becomes the growth tool with LEAST resistance for mobile users. They no longer need to fill in any form fields. They simply tap a button and what they want appears in the Facebook Messenger app. It’s one of the most user friendly website opt-in tools available today. Once you get the user into your facebook bot “flow”, you don’t need to deliver the lead magnet right away (but give them the option for that), you can ask them some questions to see if you can warm them up for another offer that you have which might lead to a sale or signup. By far, one of my absolute favorite tools for lead generation with facebook messenger because it’s faster than creating a webpage and you can reach a larger audience. You may have seen this before on facebook, where someone posts a comment on their wall or their facebook page and they tell you to “comment below ‘INFO’ and I’ll send you the details”. the most people commenting, liking and engaging on your post, the higher in the news feed facebook will put your post. That means MORE free targeted traffic for you. You can ensure that only people seriously interested in your offer get into your bot ‘flow’. This way, you know that you have quality leads seeing your offer. As a bonus, you can BOOST public facebook posts with Facebook for a fee (how much is up to you). There again, you can get very specific with your targeting and reach the right people who will be looking for what you’re offering. Please like, share and comment. Subscribe to the channel so you don’t miss anymore online marketing tips. the top as well. I absolutely liked reading everything that is posted on your blog.Keep the aarticles coming.